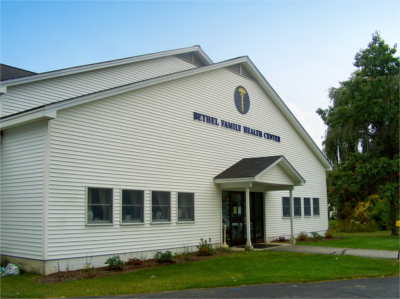 Since 1977 Bethel Family Health Center has been serving the Bethel area, officially joining HealthReach in 1999. At our health center, the top priority is the wellbeing of our patients. Our staff works with our patients to create a ‘medical home’ and the best care possible while utilizing state-of-the art knowledge and technology. Click here to learn more and to watch a video: Patient-Centered Medical Home. Our staff includes a team of physicians, behavioral health specialists, a dental hygienist, as well as clinical and administrative support staff. With our team we are able to offer a variety of services based on our patient needs. This includes check-ups, osteopathic manipulation, x-rays, lab services, and physical therapy. We also work with Maine Breast and Cervical Health and the Maine Tobacco Program to connect patients in need of these services. If outside hospital services are required, our providers have a strong relationship with Stephens Memorial Hospital in Norway, part of the MaineHealth system. Bethel Family Health Center serves families in the Andover, Bethel, Gilead, Greenwood, Hanover, Newton, Upton, Woodstock and neighboring towns region. In this area there are limitless recreational opportunities in its renowned mountain village settings. Residents can enjoy hiking White Mountain National Forest, swimming, rafting, fishing, hunting, and camping in the summer, as well as skiing, skating, and dog-sledding during the winter months. Located close to Sunday River Resort and other mountain areas, there are endless local events and festivals happening that keep the community active.